Top Travel Toys and Games for Easter Holiday Fun! This highly competitive, 15-minute family game will have you matching and grabbing at speed. Players turn their picture cards over one at a time and if any player spots a match between the card played and any card already on the table, they grab the totem from the centre. Two players are involved in the match and the person who misses the match acquires the winner’s cards. The cards have similar patterns with small differences making it very easy to grab the totem on impulse. Make the wrong call and you will land up getting all the cards played during the round from each player. There are also special action cards that can be a game changer. The winner is the first player to get rid of all their cards. This game is great for a wide age range. 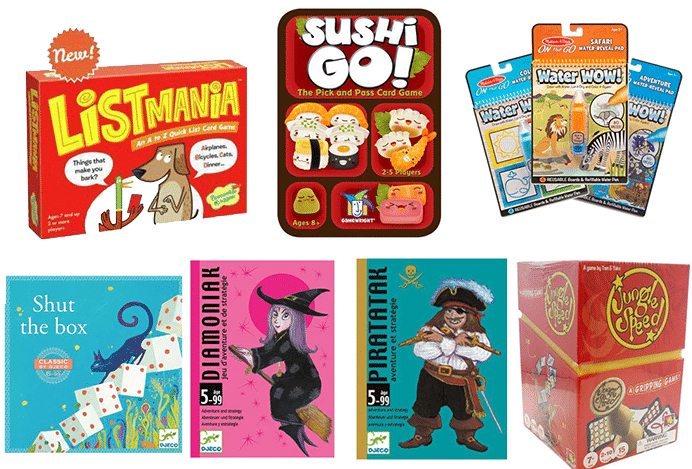 Sushi Go is a fun, quick, strategic gam that comes packed in a tin – perfect for travel! 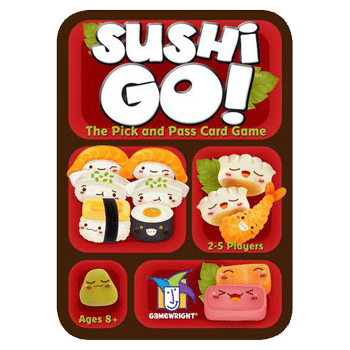 The aim of the game is to collect as many specific combinations of Sushi as detailed in the rules, such as Maki, Dumplings, Nagiri and Wasabi, while passing on the rest of the cards not required to other players who are also doing the same. When there are no cards left to play, the round is over. The player with the most Sushi combinations at the end of the round wins the most points. Throw in Wasabi and Chopstick to mix things up and increase card values. This game is easy to learn and allows for some clever plays and nasty blocks while making sushi with your cards! Who knew two dice in a box could provide so much fun and help with maths too? It can be played solo or with multiple players. Great for a quick game in a restaurant. Players roll the two dice in the box dice and shut down the number flaps (1 – 9) that add up to the number rolled e.g. if you roll a 7, you can shut down the number 7, or the 3 and 4 that add up to 7, or 5 and 2, or 6 and 1, or a combo of 3 numbers. Players continue to roll the dice and shut all the available number flaps until they roll a number that can’t be shut. Total the number of flaps left often and that’s your score for the round. 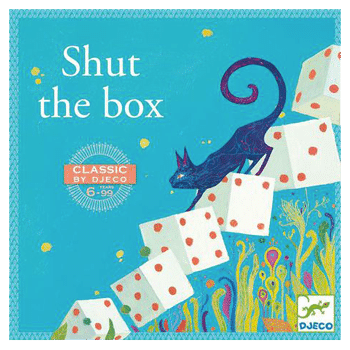 Shut all the flaps and you have shut the box and all other players receive a 20-point penalty. The person with the lowest score after 10 rounds is the winner. Perfect for playing in the car, train or plane, or simply around the dinner table or in a restaurant. Play some cards alone and some with a partner. 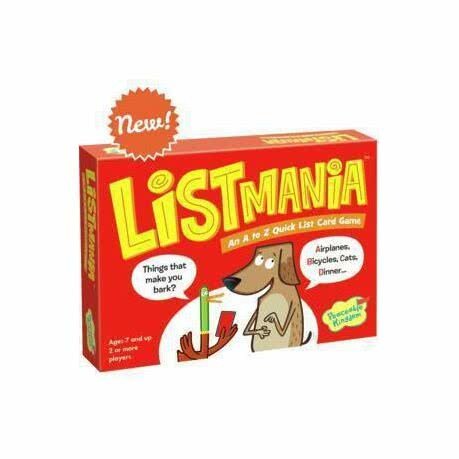 Listmania can be played competitively or cooperatively with younger children. Cards will be one of three types: list in alphabetical order starting with a specific letter; pick a partner and try to name as many items as the card requests, or list as many as you can by yourself in the time limit, for example: How many breakfast foods can you name in 30s? Name 20 things you take to the beach. Starting at the letter M name parts of the human body. This game makes you think on your feet and can be hilariously funny. A fun adventure and strategy game of high risk and reward. Each player gets to use their own strategy to build a pirate ship before the pirates take it over! The player who completes their ship first (six cards to make one of four different coloured ships) wins the game. On a player’s turn they can turn over as many cards as they wish, however, if they turn over a pirate card, they have to return three cards already collected, to the deck. 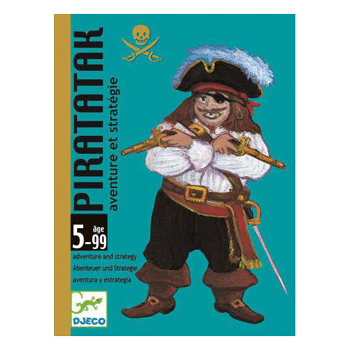 The deck consists of ship cards, pirate cards, canon cards (these neutralise the pirate cards) and gold coin cards (currency to buy ship cards from other players). The first person to complete their colour ship wins. A fun adventure and strategy game of high risk and reward. Each player gets to use their own strategy to build a castle before the witches cast a spell on them! The player who completes their castle first (six cards to make each of the four different coloured castles) wins the game. On a player’s turn they can turn over as many cards as they wish, however, if they turn over a witch card, they have to return three cards already collected, to the deck in the centre. 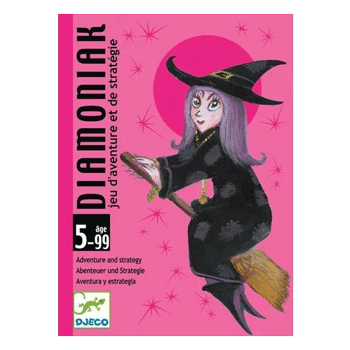 The deck consists of castle cards, witch cards, fairy cards (these neutralise the witch cards) and diamond cards (currency to buy castle cards from other players). The first person to complete their colour castle wins. This is mess free painting with water, that is highly portable. 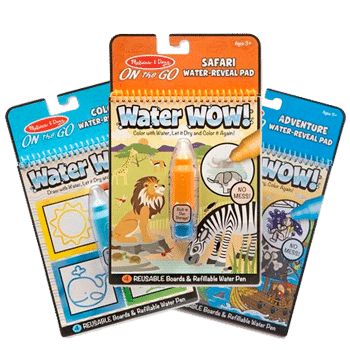 Choose from a variety of themed activity books, fill your paint brush with water and colour away. Pictures will magically appear anywhere you touch the page with water and over time they will dry and be completely reusable once again. As soon as your picture is revealed, there are additional activities such as counting, memory activities, etc. Clean, fascinating fun that can be done anywhere – in the car, on a plane, in a restaurant and more. A variety to choose from in this link.